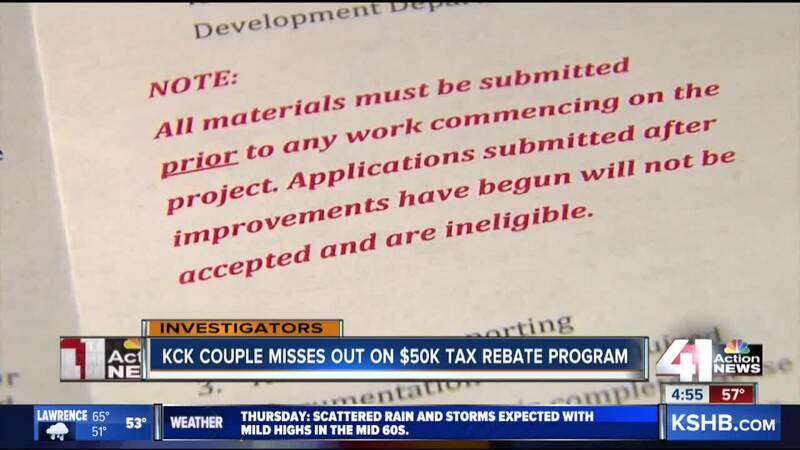 A Kansas City, Kansas man, eligible for a 95 percent property tax rebate for building a new home, has apparently missed out on that rebate. KANSAS CITY, Kan. — A Kansas City, Kansas man, eligible for a 95 percent property tax rebate for building a new home, has apparently missed out on that rebate. The Neighborhood Redevelopment Act is designed to promote investment in KCK. Jim Ellsworth, his wife Yvonne and their daughter moved into their newly built dream house just west of the University of Kansas Health System last November. The home is perched on a hilltop near other new or newer homes built in the same neighborhood. A ping pong table on the lower level is part of their fun. But a back and forth conversation with KCK's Unified Government leaders over the NRA hasn't been. As part of the NRA, new home builders like Ellsworth are eligible for up to a 95 percent property tax rebate over 10 years. Ellsworth's home is located in Zone 1 of the NRA, which is the far eastern part of KCK. It's an area UG leaders say is in most need of development, so the NRA incentives are higher than in other zones. One key element to the NRA is noted in a brochure the UG provided the 41 Action News Investigators. In the brochure, highlighted in red, it says to apply for the NRA, "all materials must be submitted 'prior' to any work commencing on the project." The idea is so UG appraisers can make a determination about what is being built before construction. The NRA is also designed to give a financial boost to investors who might not continue with their projects without the rebate. Ellsworth didn't get his NRA application from his builder, Prairie Design Build, until after he moved into the home. "The application was never made perfectly clear to anyone that the application had to be turned in prior to construction," Ellsworth said. Because of the response he's received from the UG, Ellsworth hasn't filled out his application and sent it in. However his two neighbors, who had the same builder, were able to get the NRA tax rebate. Prairie Design Build President David Schleicher claims Ellsworth's two neighbors both finalized their NRA rebate deals after they moved into their homes. But one of those neighbors provided us with documents showing Prairie applied for the NRA before construction began on that home. The Unified Government's director of Economic Development, Katherine Carttar, says Prairie applied properly for both of Ellsworth's neighbors, but not for him. When asked if Prairie dropped the ball for Ellsworth, she said, "I believe in that case, that is true. Unfortunately in this case, Mr. Ellsworth nor his builder applied prior to completion of the house." For Ellsworth, it means a loss of up to $50,000 in tax rebates. "It's not chump change," he said. For a community actively seeking new investment with this kind of incentive, Carttar admits the UG hasn't done a very good job of publicizing the NRA rebate until now. "Every time you go to get a building permit, whether you're building new or you're doing some renovations on your house, we want you to check this out," she said. The NRA Property Tax Rebate Program is available for both commercial and residential property. Property owners can also apply for the program if they're making changes to their property which will improve its value by at least 15 percent.